With the expansive growth the CPN Health Services have experienced in the last decade, there always seem to be new facilities, health sectors and health providers when patients visit one of the two clinics. One of the new faces those seeking eye care will see is CPN’s new Director of Optometry, Walter C. McLaughlin O.D. McLaughlin’s family has been in the Shawnee, Oklahoma area since the dawn of the 21st century. His grandfather, an optometrist by trade, came to Oklahoma after completing his medical training at Southwestern Medical Optical College in Kansas City. In fact, his grandfather’s 1918 diploma hangs in Dr. McLaughlin’s office at the CPN Health Clinic East. His grandfather’s practice began what seems to have become the family business, with McLaughlin’s father also having been an optometrist whose practice long served the citizens of Pottawatomie County. His uncle and two aunts were also optometrists. Given his deep ties to the community in Shawnee, it’s no surprise that Dr. McLaughlin is a member of the Pottawatomie County Historical Society. He quickly cites the various locations around downtown Shawnee that once housed his grandfather’s, then his father’s optometry practices. He is a graduate of Shawnee High School with the class of 1976. He attended East Central University in Ada, Oklahoma before being accepted to Southern College of Optometry, based out of Memphis, Tennessee, in 1982. It was the same school his father, aunts and uncle also attended. Upon graduation he returned to Shawnee and joined his father’s practice in 1982. His father retired in 1995 coinciding with Shawnee Medical Center – now Saint Anthony’s Hospital Shawnee – opening an optometry practice. 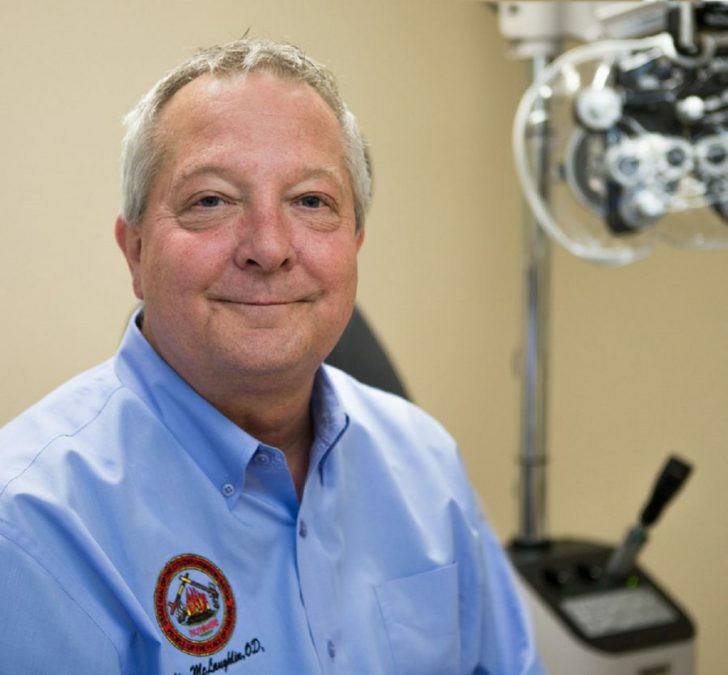 McLaughlin moved there and served as the only eye doctor in St. Anthony’s entire system until 2016, when the hospital opted to close the practice. “A couple days later I got a call from (CPN Health Services Director) Chris Skillings. He said ‘We have a place over here for you, come talk to me,’” said Dr. McLaughlin. He has been on staff at CPN since February 2017, and owing to the demand for more services helped bring on a second optometrist in recent months. While Dr. McLaughlin said that he is enjoying his new role with the tribe’s health services, one aspect that saddens him is no longer being able to care for those he has spent decades treating. CPN tribal health services are only open to members of federally recognized tribes, CPN spouses and tribal employees. “The only bad thing is, 90 percent of my patients, I can’t see anymore. Some of them I’ve been seeing for 30 something years,” he explained. However he remains busy, with a steady stream of patients coming through during the week. By his estimate, Dr. McLaughlin says he sees between 15-20 patients a day. He noted that before the implementation of electronic medical records, he could see up to 25 patients in that same amount of time. While he admitted it was more time consuming, he praised the positive impact electronic records have had on his work. Transitioning into the work has been helped, he said, by the quality of the staff and equipment he has at his disposal. Those wanting to establish patient care with Dr. McLaughlin or other CPN Healthcare providers, please visit https://www.potawatomi.org/services/health or call (405) 878-4693.